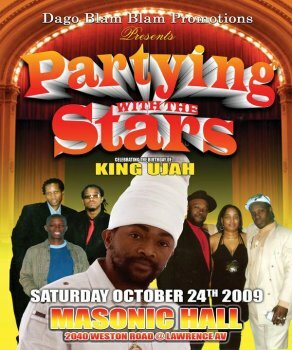 Dago Blam Blam Promotions presents an evening called “Partying with the Stars!” Featuring an evening of live entertainment from Toronto’s best independent artists, Toronto’s elite Reggae and Dancehall artists also gather to celebrate the birthday of King Ujah! As Canada’s most award winning male, King Ujah will perform for fans, and will share the stage with fellow stars Exco Levi, Chester Miller, Eyesus, J-Logix, Firekid Steenie, Fire Chess, Mikhal Fury, Fire Dutch, Vipa, Willow, Rich Kid, Busha and Flavour Stars. Taking place at the Masonic Hall located at 2040 Weston Road (at Lawrence), fans will be treated to Dancehall and Reggae vibes, with additional music provided by Coco Bam (of Dago Blam Blam Sound) as well as King Majesty featuring Marvin Chin and Troopa. Festivities begin at 8pm, and the event is free before 9:30pm. Admission goes $15 after. There will be a raffle for prizes. For additional information on Partying with the Stars, contact: 416-780-0752.